From #metoo to “fake news,” from refugee crises to global climate instability, the world’s problems are getting hotter, and our culture of disconnection makes solutions seem impossible. Is it possible to untangle deep societal conflicts within a field of love? We believe it is. 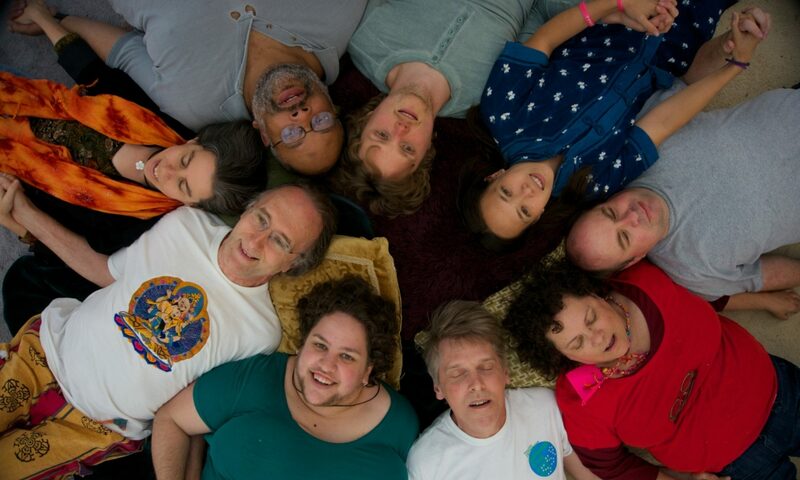 In this summer’s program, we begin by inviting everyone into a field of love and connection – the field we have built together for over a decade. Once connected, with the assistance of creative and wise facilitators, we open a space for whatever is in our collective field that needs expression. All voices are welcome – we join in humility and compassion to witness all that is human and listen for the future that wants to emerge. Let’s find out who’s here and what we have to offer each other! We’ll spend much of the time moving around, meeting new folks and deepening existing relationships. Participants can engage with the group and get quick, direct feedback on issues they care about. We’ll also have time to go deeper in one-on-one connections. This is a quick, fun, easy way to meet lots of people, get a sense of the diversity of the group, and explore opening up to each other. On our first morning together, we’ll create the cultural container that will hold and nourish us for our collective adventure. We’ll discover our intentions for camp, meet our teams and people with special roles, and start building a field of empowerment, love, and freedom. Sarah, Ben, and Dawson will guide us in a dynamic combination of sweet connection activities (including Hand on Heart) and compelling logistical details. The organizers request that all campers join us who are not performing camp duties so that we can form our community with common understandings. Mmm, that glorious moment in connection or collaboration when everyone is a “hell yes” to exactly what’s happening! Sometimes we find that “sweet spot” spontaneously—but more often, we find it through clear communication and feedback. How many of us say “yes” to things we don’t actually want out of guilt or a fear of losing connection? In many ways, “no” is the most daring and intimate response possible – if I can hear your “no”, I can trust your “yes.” To help us find the space of mutually desired connection that is available with each person, we’ll practice the skills of self-awareness, transparency, and non-attachment. The more we do our own personal work, the more available and loving we are in the moment. We no longer cling to rules and impose agreements that we hope will keep our intimates from triggering painful emotions in us; we welcome and work with our emotions, speak our truth, and create the world we want moment by moment. As we move through the world, we create stories that we hope will help us understand ourselves and the people around us. Sometimes these stories do help, and sometimes they get in the way – especially when we jump to conclusions and interpretations that go far beyond the information our senses are providing us. If others create a different interpretation from the same information, we can find ourselves in conflict with them without understanding why. Our stories can generate powerful emotions in us – fear, joy, anger, sadness – which may lead us to take actions that don’t serve us. How do we hold our emotions skillfully, even when they feel overwhelming? How can we recognize when we are creating a story, and become curious about what other stories might be just as true or even truer? Heart of Now is an experience of creating intimacy by letting ourselves truly open and be seen by each other. In a culture that teaches us that we must only show our best self, it’s a radical act to be who we really are and share our truth. When we take the risk to share deeply about our journey on this path, we grow closer. And when we do this as a community, we exponentially expand the possibilities of what we can create together! “Triads” is an experience where everyone who wants to will have an opportunity for deep personal sharing and discovery in small groups. As listeners in those groups, participants will build capacity for compassionate witnessing and simple coaching. We invite the community to dive into this culture of sharing, witnessing, and coaching as a path to intimacy and emotional resilience at this camp and beyond. After the Sensual Space Orientation, those who wish will proceed to the Sensual Space for its official opening. All are invited to explore the Sensual Space – the opening activities will be sensual but nonsexual, and the Sensual Space Team will create a clear transition when the space becomes open for sexual connection. After two days of orientation, it’s finally time to jump. I will not promise you a rose garden (at least not one where roses don’t have thorns). It may be more like a roller coaster ride. But I will promise you to do whatever is needed to encourage you to experience some extraordinary camp days. It could be that you need more access to your anger (for setting clear boundaries, for saying yes and no, for speaking up, for expressing your needs, for taking a stand), your sadness (for being in the speed of love, for connection, for letting go if somebody says no, for acceptance), your fear (for being creative without knowing if it will work, for being present and awake, for sensing other people’s’ boundaries and wishes accurately), or your joy (to inspire and motivate and celebrate and enjoy each connection fully). It could be that training yourself in asking dangerous questions allows you to experience more intimacy in all bodies. It could be that it’s about the stories in which you live and how to choose those which empower you instead of allowing you remain in victim mode. Whatever it will be, I invite you to two hours of high-level fun, excitement, transformation, and expansion of what you thought are the limits of what you are able to experience. Unfortunately, most of us were never taught to seek pleasure in our bodies. Pleasure is the secret ingredient to much of the body’s healing, and is available to us in every moment. Nia is a movement practice that is accessible to all body types, all ages, all abilities. Every move can be modified to fit your body perfectly by simply seeking pleasure! In this workshop, we will spend the first hour learning some of the basic Nia moves: easy, organic dance steps, martial arts movements (blocks, punches and kicks), and some very basic yoga-like poses. We will practice tweaking each move to sense more pleasure in our bodies. In the second hour, we will do a classic Nia routine where we will blend our heightened sensory intelligence with soulful music, using simple movements that heal the body and inspire the spirit. We will be offering workshops based on Process Oriented Psychology, or Process Work. Process Work is an awareness based method that brings together working with body symptoms, dreams, relationships, meditation, spiritual work, group and worldwork into a unified approach. In these workshop we will focus on introducing the work; working with chronic body symptoms; childhood dreams and life myth; the signals, double signals and inner work around consent; and then do extensive work with the entire group on its group process around central issues and polarities. The work is feeling, playful, intense, and brings new insights into often stuck places. Expect to be amused and surprised by the variety of unusual items and services donated by fellow campers for bidding. Previous auctions have included such offerings as “1000 kisses” and “a morning serenade.” Auction proceeds help to provide scholarships and improve future camps. Sarah will invite you into a series of partnered and group interactions to celebrate the divine in you and in your fellow participants. Beginning with ritually honoring one another, we will open up to emotional and physical intimacy. This love ceremony will focus on connecting and nurturing touch. All participants are always “at choice” to modify the interactions so that they are comfortable with them, or simply to witness. A perfect way to integrate your experience over the week, this two hour introduction into Jack Painter’s PHI breathing will guide you from safe and secure breathing, into increasing amounts of openness and freedom. We start solo, exploring the nurturing energies of four different breathing patterns and their associated supportive statements. Once our individual energy has been liberated and given permission to flow, we can also share with others in ways that range from comforting sweetness to ecstatic bliss. Is it time to celebrate? Or time to lick your wounds? Here is the secret (okay, not really): Being alive comes with pain. If you don’t feel pain, you don’t know what to change, or where to look. And: If you try to get rid of the pain, you will lose the joy, too. Even intense joy may feel painful in some ways – if only the pain of knowing that the camp will end soon. Let’s say: We will celebrate our humanness, experiencing each other while sharing what’s alive in us after those intense camp days. Maybe some conflicts have to be addressed. You will not be forced but invited to address them in this safe space. Maybe you’ll need support for the transition between camp and daily life so that you can take some sparks with you. It’s about becoming a team where we create possibilities for each other. Whatever you may need, whatever needs to be shared or hold or embraced – this space offers the opportunity for that. “Nobody cares if you can’t dance well. Just get up and dance. Great dancers are great because of their passion.” ― Martha Graham. Whether you’ve danced all your life or never set foot on a dance floor– come express yourself with radically accepting, loving community! In this space, all forms of expression are welcome– from yoga, to laughter, to shaking, to rest. All bodies, movements, emotions, and sounds are welcome… in our Dance Playground. Come one, come all, and show us more about you! No talent is required – “if you can walk, you can dance; if you can talk, you can sing”. Honoring the experience of the past ten days, we will connect, reflect, and bid farewell to this incarnation of our community. Lighter Side – as the mood strikes us! Participants create and perform skits to illustrate humorous events that they have observed or experienced at camp.